Working closely with the Welsh Government has ensured that we are now receiving a steady stream of revenue, our previous concerns are now totally resolved. We have refined our processes to ensure all the information needed by Welsh Government is provided to them correctly first time. This means that they can pay the grants promptly and saves them a lot of unnecessary work. A small number of our early connections have still not submitted the correct paperwork to Welsh Government. As a result Welsh Government are unable to process their grant payments. Reminders have been sent out by Phil Middleton as we need these people to complete the grant process so that their grants can be paid. If you need assistance with this just ask, we are here to help if required. Gary & Daryl have now finished all their work for us. Lately they had some very difficult crossings to do in rocky ground conditions and although they encountered problems they managed to find a way around all of them. Brin continued to work with them as he has done from the very start. It shows how long the project has been going when you think that Brin has endured freezing conditions, a blazing hot summer and lately, very wet weather. Many thanks to Brin for all his hard work not only with the directional drillers but on many other aspects of the project, he truly is a Community Champion. There is very little trenching left to do as Chris and Dave Walford have just about completed this initial phase of the project. A great job done and huge thanks from everyone to you both for the hard work and effort over the past months. All issues were resolved as they arose, with minimum disruption. 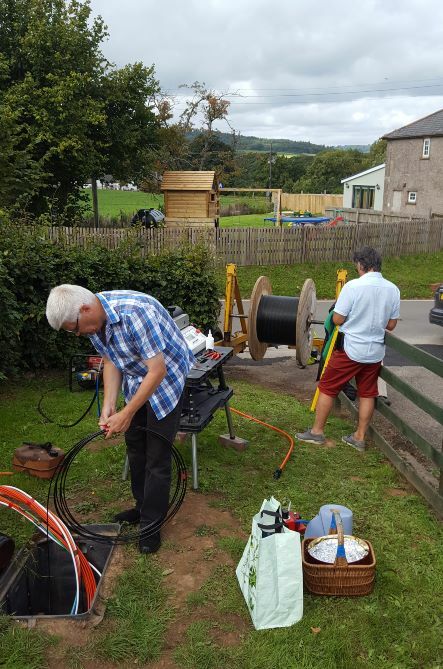 FTU’s or Fibre Termination Units are being installed by Glyn and Jim either before or after the fibre is blown. This enables Carina to come along and splice a pigtail ready for the router to be connected. To date 108 FTU’s have been fitted, which means that well over half of the people connecting now have them. When the project started we thought there may just be 80 people connecting but since then, additional properties have come on board and as a result, there are now just under 200! Glyn and Jim have a lot more FTU’s to fit over the next 2 weeks, so we will see this number rise considerably. They are both very grateful for the tea, coffee and cake offered whist in the process of their work ~ More golf for both of them after this is all done to work off all the cake!! Mark Graveston installed the splice bullet at Pound Hill chamber which is the first link for the surrounding properties. Thank you Mark. This has enabled Carina to continue working on the Cefn Mably Park and Cefn Mably Lakes connections. Today we have a total of 92 live connections. The recent work has included splices in the Hub to “Patch” them into the server as well as pigtails in homes and splices in the corresponding splice bullets, it is anticipated that over 1000 splices will have been carried out by the time we finish this first phase of the project ! ! !. We have now blown the 72 fibre from Penylan through the Pound Hill chamber and onwards to Flat Holm, this was a total of 1608 metres. The next fibre blow will get the fibre from Flat Holm down to Croescarneinon, then onto The Hollies and onward to Penygroes. We will try and blow this in one complete length which, if we can, will be much appreciated by Carina as this avoids the need to carry out multiple splicing just to connect the main fibres ! The twin fibres have now been blown to Menorca Cottages, Bridge Farm, Ruperra House and properties around the Pound Hill Chamber. It won’t be too long now until these properties are enjoying Gigabit internet speeds. 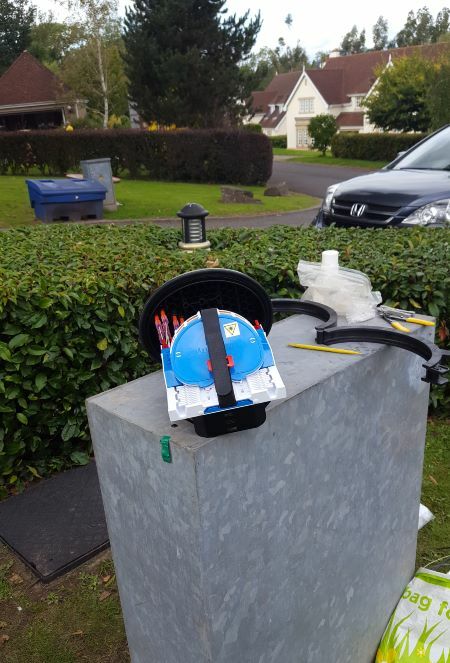 Jason has been very busy Geo Ripping his way across lawns to get the ducting up to properties. Thank you Jason, this has been a huge job and has been of enormous benefit to those who are unable to dig trenches across their gardens. Without you and Brin to do this for them over the course of the project it would have given a few of them headaches for sure ! ………….. or backaches ! We have been like a group of worker bees up at Cefn Mably Park in the past weeks and have achieved great success. Around three quarters of the houses are now connected, we are awaiting approvals from the Welsh Government for the newer applications before we can connect them too. The apartments in the main house still pose a challenge in getting the ducting into them, but we will not let a difficult situation prevent us from connecting properties, this one may take a little longer to resolve, but we will get there. Work will be going on all around the village with different tasks in each area. Menorca Cottages will see their FTU’s and pigtails fitted, Flatholm, Steepholm, Croescarneinon, The Hollies and Penygroes will see new ducts, fibres blown, FTU’s and pigtails. Additional work will continue to complete connections, installing splice bullets at the 50 Acre Field and Penylan. It will not be too long before we have the whole of the village connected ! A reminder for your diaries. I have sent out a mailshot with more details on what you can expect to see on the day. If you have not seen this, please go into your “junk” or “spam” folders and identify as non-spam to receive it without any problems. We are also going to try and get hold of a PC expert to give general advice and answer any of your PC questions. I have started to hand out Customer Feedback Forms and I am leaving one with every new connection. The objective is to assess where we have succeeded and where we need to make changes in our processes or methods, along with providing some Customer Testimonials to put on our website. The date of the next meeting is Thursday 4th October 2018 at 7.30 P.M. PLEASE NOTE: We are going to have subsequent meetings every three or four weeks as we come to the completion of the project. Watch this space.